A LOCAL election leaflet from the ruling party in Hackney has been roundly criticised. The cover of Labour’s four-page brochure says that the party asked “local residents” what is “great” about the borough. Two of those pictured, however, are Labour councillors, the man at centre is the Labour Mayor, another is standing for election as a Labour councillor and a woman wears a Labour rosette. You might think it’s like the Tories asking “British residents” what they think of Britain and filling it with the views of David Cameron, Theresa May, William Hague and Michael Gove. Hackney Conservatives campaigner Amy Gray told Loving Dalston: “This stinks. When is Hackney Labour going to stop treating people like idiots? 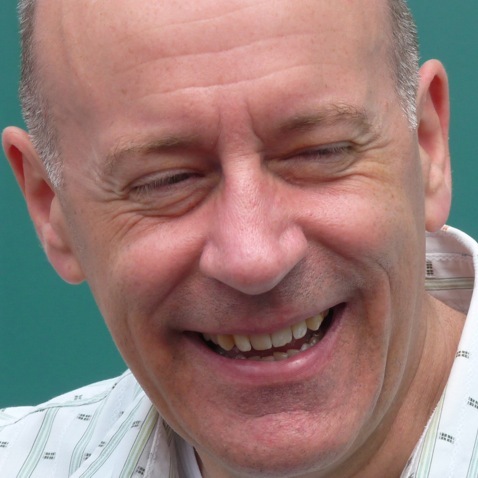 Liberal Democrat mayoral candidate Simon de Deney commented: “The fact that Hackney Labour believes it can present its councillors as ordinary members of the public without their being recognised surely shows just how little contact they have with their ward residents? Hackney First mayoral candidate Mustafa Korel said it was “laughable that Hackney Labour could not engage with the folk who make up our diverse borough and who are fed up with one party ruling all politics”. Perhaps, he said, it was one way of giving incumbent mayor Jules Pipe the “I’m an ordinary bloke” look of someone “who is on your side”. Hackney Labour organiser Tom Dewey denied the leaflet was misleading. Pictures of other people were available but were not used because of the difficulty of getting explicit permission in time, which was, he said, mandatory when quoting people on political leaflets. 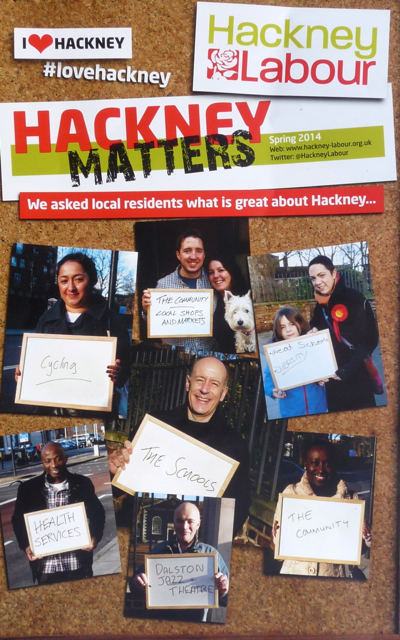 None of the voters shown the leaflet by Loving Dalston recognised Mayor Pipe nor any members of his regime. * Elections for Hackney councillors, for Hackney Mayor and for the European Parliament will be held on Thurs 22 May 2014. I have lived in Hackney for over 50 years. Does anyone know where Jules Pipe was born, what school he attended, etc? Apart from a few basic facts, he seems to be vague about his connection with Hackney. Pipe says on the Hackney council site http://www.hackney.gov.uk/mayor-biog.htm that he was born and grew up in East London. And as we know, he has lived in Hackney for many years. Bit of a pity: I was mentally constructing a biography of his having born into a Parisian family of resistance fighters after it was given refuge in our great city because the SS were about to arrest them. Mais non: the truth is mundane and the Jules is a nickame rather than a signifier of French origin. There must be some interesting Hackney councillors. – Ed.